Born in Minsk, Belarus, MZ grew up in Brooklyn in an immigrant family which fled the USSR due to antisemitism. He attended public school until enrolling in the Boston College Carroll School of Management, from which he graduated with a B.S. in Operations & Business Consulting. During his time at BC, he became heavily involved in Israeli Advocacy, co-founding “Eagles for Israel.” While running diplomatic and cultural events, MZ met Rabbi Chananel Weiner, a student of Rabbi Noach Weinberg zt”l (the founder of Aish). Rabbi Weiner opened MZ’s eyes to the depth and beauty of his Jewish roots. After graduation and before jumping into the corporate world, MZ came to Aish to learn more and decided to stay, having found his calling in life. With seven years of Torah study under his belt, MZ received Rabbinical ordination from Rabbi Nachum Barowski and Rabbi Avigdor Nebenzahl. He acts as the Director of the Found AISH Honors program, in which he teaches daily and serves as a mentor to students past and present. 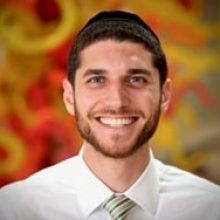 Rabbi MZ enjoys playing basketball, hiking, taking joyrides, listening to music, and teaching his kids about this wonderful world in which we live. He and his wife often host for Shabbat in their home in French Hill, Jerusalem.